Prepared construction bid documents, plan sets and performed site inspection services for the reconstruction of two tennis courts, a basketball court and a new tot lot for the very popular City park. Provided survey, design and environmental permitting services for multi-use pedestrian path improvements within the Mill Creek Greenway corridor. The design required two trail head parking improvements and consideration of creek crossings, wetland impacts, no-rise flood plain analysis and pedestrian safety at four major road crossings. Additionally, a public parking lot, trailhead signage, viewing platforms and benches were trail amenities integrated into the design. 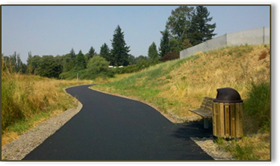 The trail construction required a DSL/ACOE removal fill permit as wetlands were impacted and mitigation for the impact was thru the purchase of available wetland mitigation bank credits. Prepared land use application plans and final construction/grading plans for two new parking areas to serve the public park. The design incorporated vegetated planter boxes with an under-drain collection system directed into the existing storm system. 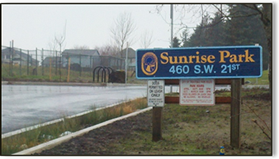 Coordination with the Oregon Department of Environmental Quality was an element of this project as the park is situated on top of a permitted obsolete landfill, and methane safety measures were necessary during construction of the parking improvements. Prepared the site design and foundation design for a new public restroom to be constructed in Beulah Park. Project included design for water and sanitary sewer utility extension to service the new restroom. FDG prepared a master plan and preliminary engineering for the City of Oregon City to transform the existing gravel lot Clackamette RV park into a more formal RV park. The proposed improvements include paving defined spaces, incorporating site amenities to each space and integrating lush landscaping to create an elevated RV camping experience. Prepared the site design and assisted METRO with the City of Portland permitting process to construct a new storage building that will house a new fleet of electric carts and the building will be outfitted with solar panels to augment the charging demands. FDG assisted METRO with survey base mapping of several areas within Oxbow Park for master planning and future site improvements. Currently FDG is developing site plans for future additional camping sites within Oxbow park. FDG assisted METRO with survey base mapping of several areas within the park and provided civil engineering design services in support of the re-vamp of the entrance to better facilitate vehicle queuing. Stormwater LID techniques were employed for the entire project.